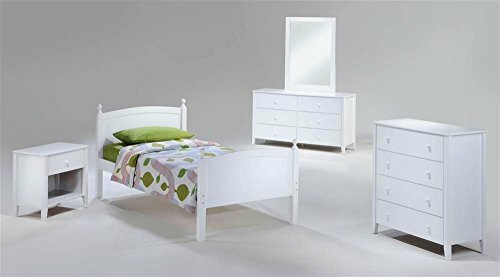 Set includes bed, nightstand, chest, dresser, mirror. 100% Malaysian Rubberwood construction. Warranty: 5 years. White finish. Bed: 57 in. W x 80.6 in. D x 40.9 in. H (39.7 lbs.). Nightstand: 23.6 in. W x 15.7 in. D x 24.6 in. H (29.7 lbs.). Chest: 35.4 in. W x 17.7 in. D x 40.2 in. H (74.8 lbs.). Dresser: 57 in. W x 17.7 in. D x 31.9 in. H (95.2 lbs.). Mirror: 31.1 in. W x 2 in. D x 42.5 in. H (21.8 lbs.). Licorice! Yummy, chewy and so so good. It's sometimes sweet, sometimes salty, sometimes red, but mostly black. Licorice's delightful variations keep it forever a favorite. So naturally, for our timeless Licorice Bed such a tasty confection brings on all its sweet associations. Take care of your kids' needs for beds, bunks and storage with our Zest Bedroom Collection for Night and Day. Smart quality at extraordinary value. We have gone to great lengths to design and engineer this complete line to keep your cost down and your pleasure up. If you have any questions about this product by Night & Day Furniture, contact us by completing and submitting the form below. If you are looking for a specif part number, please include it with your message.